Grande, F. D., Cornejo, C., Scheidegger, C. and Beck, A. (2015). Genomic DNA Extraction and Genotyping of Dictyochloropsis Green Algae Strains. Bio-protocol 5(15): e1545. DOI: 10.21769/BioProtoc.1545. Dictyochloropsis is an ecologically important genus of free-living and symbiotic green algae. Representatives of this genus are horizontally transmitted among several fungi of the family Lobariaceae, thus forming photobiont-mediated guilds. This protocol is suitable for extracting DNA from algal cultures and lichen samples and for genotyping seven unlinked Dictyochloropsis reticulata microsatellite markers in a single PCR multiplex. in size of algal culture (Beck et al., 1998) / lichen thallus in 2 ml tube (see Figure 2). Add 2 steel balls in each tube. Cover the open tubes with soft tissue paper. Cool samples in -20 °C freezer for at least 6 h.
Fit the tubes in the lyophilizer and lyophilize overnight. Crash the lyophilized samples using the ball mill MM 400 at 30 Hz for 30 sec without buffer at ambient temperature. Spin down for a few seconds the crashed sample before proceeding with DNA isolation. For DNA isolation follow DNeasy 96 Plant Kit, Qiagen protocol (Plant Handbook 10/2012, http://www.qiagen.com, pages 31-34). For buffers AW1 and AW2, before using for the first time, add the appropriate amount of ethanol as indicated on the bottle to obtain a working solution. Preheat Buffer AP1 to 65 °C. Elute the purified DNA from the DNeasy spin column using Buffer AE twice (2 x 50 μl). Note: Smaller or larger elution volumes can be used for more or less concentrated products. To ensure complete elution, 40 μl should be the minimum elution volume. Prepare 1% agarose gel with 1x TAE buffer. Add 0.5 μl GelRed for 100 ml gel. Add 1 kb or 100 bp ladder for reference. 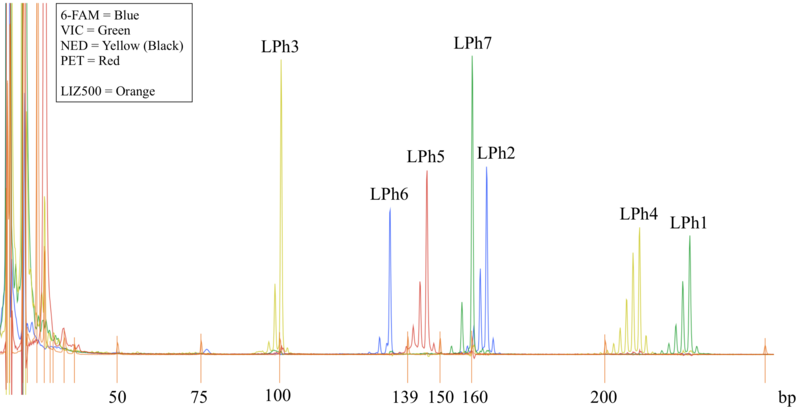 Check DNA for quality and quantity in gel doc system (Figure 3). First prepare 100 μM primer stocks. Mix all primers according to Tables 1 and 2 to get 1ml primer-mix (sufficient for 10x 96-sample PCR plate). Thaw template DNA, RNase-free water, the primer mix and the 2x Type-it Microsatellite PCR Master Mix, if stored at -20 °C. Mix the solutions completely before use. Prepare a reaction mix according to Table 3. Note: The reaction mix contains all the components required for multiplex PCR except the template DNA. Prepare a volume of reaction mix 10% greater than that required volume for the total number of reactions to be performed. Mix the reaction mix thoroughly and dispense appropriate volumes into PCR tubes or plates. Note: Mix gently by pipetting the reaction mix up and down a few times. It is not necessary to keep samples on ice during reaction setup. Store PCR products in -20 °C, until further processing. Dilute the PCR products 1: 10 with RNAse-free water. Combine 1 μl of diluted PCR product with a buffer containing 9 μl of a denaturing agent (Hi-Di™ Formamide) and 0.5 μl LIZ500 size standard. Note: For one 96 well plate prepare buffer for 105 samples. Centrifuge the plates briefly (5 sec) at 1,500 RCF. Note: Fill any blank sample-well with nuclease-free water. Import the raw data files generated by the sequencer to the computer with GeneMapper software. Select ‘Create new project’ from the 'File' menu. Create marker panel and bin set. Choose ‘Microsatellite default’ as table setting and ‘Microsatellite analysis method’ as the analysis method. Set the panel for the 7x-primer mix. Set size standard as LIZ500 and exclude the 35- and 250-bp peaks. Note: If some samples fail to match size standards, go to edit size standards and override size. If this does not solve the issue, there might be some problem with the sample or the analysis run. A simple, representative example of data that indicates what type of results to expect (Table 4). Note: Numbers indicate the relative size of each microsatellite allele in base pairs. For one liter of medium, take 10 ml of macronutrients and 1 ml of micronutrients, add 0.715 g HEPES buffer (final concentration 3 mM) and fill up to 1,000 ml with distilled water. Adjust pH to 5.5 with HCl. 20 g agar may be added. Autoclave and add 1 ml sterile vitamin solution after cooling down to at least 60 °C. Sterilize the vitamin solution by filtration using a 0.22 µm sterile polyethersulfon syringe filter. Note: To receive higher amounts of algal cells 1.5% glucose and 1% proteose pepton can be added. This study was supported by ‘LOEWE, Landes-Offensive zur Entwicklung Wissenschaftlich-oekonomischer Exzellenz’ of Hesse’s Ministry of Higher Education, Research, and the Arts, by the Swiss National Science Foundation (projects 31003A-105830 and 31003A-127346 to C.S. ), and by the German National Science Foundation (project BE3825/4-1 to A.B.). Beck, A., Friedl, T. and Rambold, G. (1998). Selectivity of photobiont choice in a defined lichen community: inferences from cultural and molecular studies. New Phytologist 139(4): 709-720. Dal Grande, F., Beck, A., Cornejo, C., Singh, G., Cheenacharoen, S., Nelsen, M. P. and Scheidegger, C. (2014). Molecular phylogeny and symbiotic selectivity of the green algal genus Dictyochloropsis s.l. (Trebouxiophyceae): a polyphyletic and widespread group forming photobiont-mediated guilds in the lichen family Lobariaceae. New Phytol 202(2): 455-470. Dal Grande, F., Widmer, I., Beck, A. and Scheidegger, C. (2010). 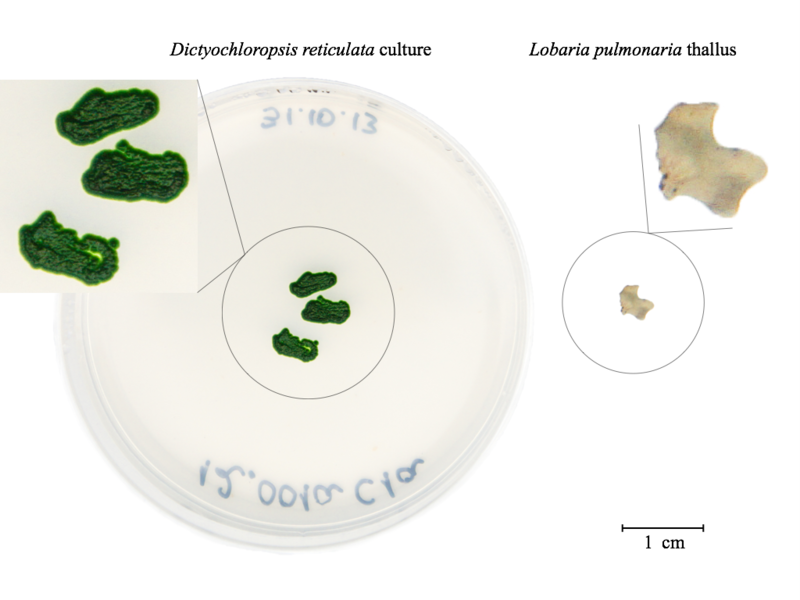 Microsatellite markers for Dictyochloropsis reticulata (Trebouxiophyceae), the symbiotic alga of the lichen Lobaria pulmonaria (L.). Conservation Genetics 11(3): 1147-1149. How to cite: Grande, F. D., Cornejo, C., Scheidegger, C. and Beck, A. (2015). Genomic DNA Extraction and Genotyping of Dictyochloropsis Green Algae Strains. Bio-protocol 5(15): e1545. DOI: 10.21769/BioProtoc.1545.